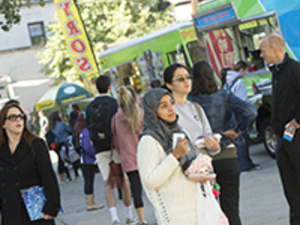 Back by popular demand, the International Week Committee has invited several of the most popular food trucks in the city to share their innovative and delicious cuisines with you. They will be outside of the Union during the lunch hour on Wednesday, October 18, 2017. Cultures from all over the world will be represented by several of the most popular food trucks in the city. Recipes and cuisine are one of the many things that migrant peoples can take with them and can serve as a reminder of that which has been left behind. Students can learn about the problems facing these communities while sampling their innovative and delicious cuisines. Wednesday, October 17 at 11:00 a.m. to 2:00 p.m.